After prevailing in a 76-67 clash with the Providence Friars (13-10, 3-7 Big East) on Wednesday, the Georgetown men’s basketball team (15-8, 5-5 Big East) faces another divisional dogfight. The Butler Bulldogs (13-10, 4-6 Big East) and the Hoyas will tip off at 12:00 p.m. ET at the Capital One Arena. Watch the game on MASN2 or follow with live stats at guhoyas.com. Butler is headed to D.C. rested after their week off. The Bulldogs are carrying a tough road record (1-5), but between the Hoyas and the Bulldogs, the visiting team has won the last six showings. Butler lags behind Georgetown in the Big East standings, as Georgetown hangs onto its fourth place conference ranking ahead of a closely competitive back half. Villanova (19-4, 2-0 Big East) and Marquette (19-4, 8-2 Big East) sit in first and second in the conference, respectively, while Georgetown and St. John’s (17-6, 5-5 Big East) sit at 5-5. The next four teams are 4-6, foreshadowing some emerging competition in the bottom half of the conference. If Butler wants to claw out a fifth straight appearance in the NCAA tournament, it will have to close the gap between the Bulldogs and the Hoyas and gain an edge over Creighton (13-10, 4-6 Big East), Seton Hall (13-9, 4-6 Big East), and DePaul (12-9, 4-6 Big East). Expect a motivated Bulldog team with more bite than bark. Ewing’s Hoyas may be hounded by the Bulldog defense in a dog-eat-dog match. 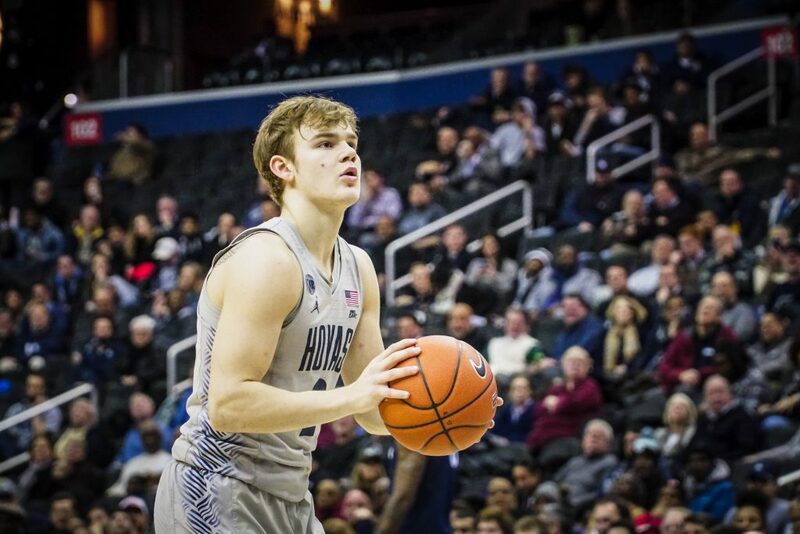 Hoya freshmen guards James Akinjo and Mac McClung will have to overcompensate for Georgetown’s bottom-of-the-barrel Big East defensive ranking, but they’re supported by a strong cast. In their past outing, Akinjo scored 10 with eight assists and McClung put up 13. Five Hoyas reached double digits. Freshman forward Josh LeBlanc went for 17 points and 11 boards, and Pickett went for 12 points. For live coverage of the game, follow @GUVoiceSports on Twitter.